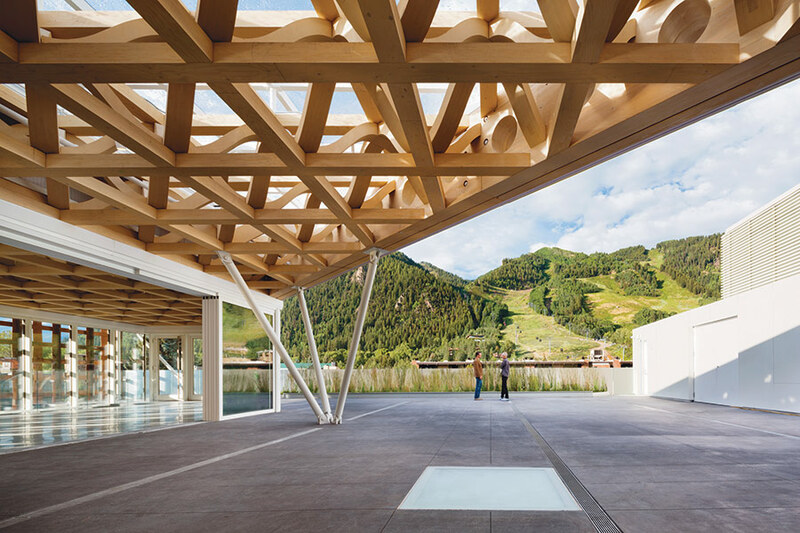 The new Aspen Art Museum (AAM), deigned by this year’s Pritzker Prize Winner, Shigeru Ban, is not a beautiful building. It does not seek to inspire awe in visitors with its formal qualities, nor even to create a harmonious experience with well thought out proportions. It rather reads as a series of cobbled together solutions to a list of architectural problems; solutions that somehow manage to sit together fairly well, if somewhat awkwardly in places. 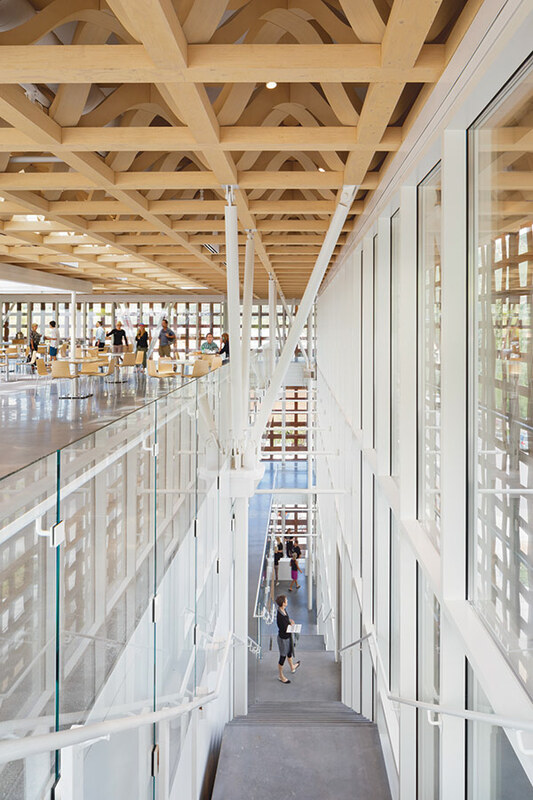 The challenge for Ban and his team was to integrate the building respectfully within the built fabric of Aspen while at the same time taking full advantage of the natural beauty of the Rocky Mountain setting and providing world-class facilities for displaying an ever-changing array of art. AAM is not a collecting institution. Its director, Heidi Zuckerman Jacobson, is always on the search for the next upcoming artist, and thus the display spaces had to offer a lot of flexibility. All of this had to be accomplished on a constrained site, only 100 feet by 105 feet, and within Aspen’s 47-foot-high zoning limit. 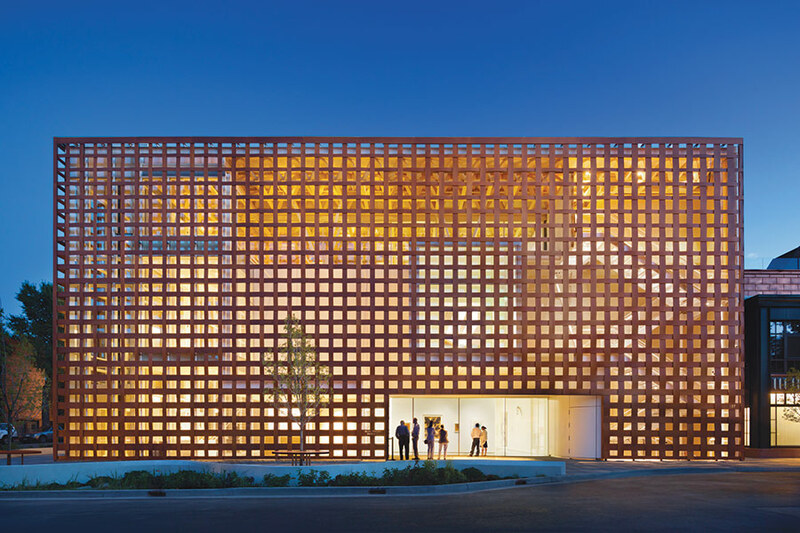 Shigeru Ban wrapped the Aspen Art Museum in a woven Prodema screen whose warm wood veneer successfully cozies up to the mountain hideaway’s timber and masonry built context. But, it doesn’t quite conceal the architectural problem brooding underneath. Cottle Car Yaw of Basalt, Colorado, is the architect of record; Front Inc. provided facade consulting services; and L’Observatoir International designed the lighting scheme. 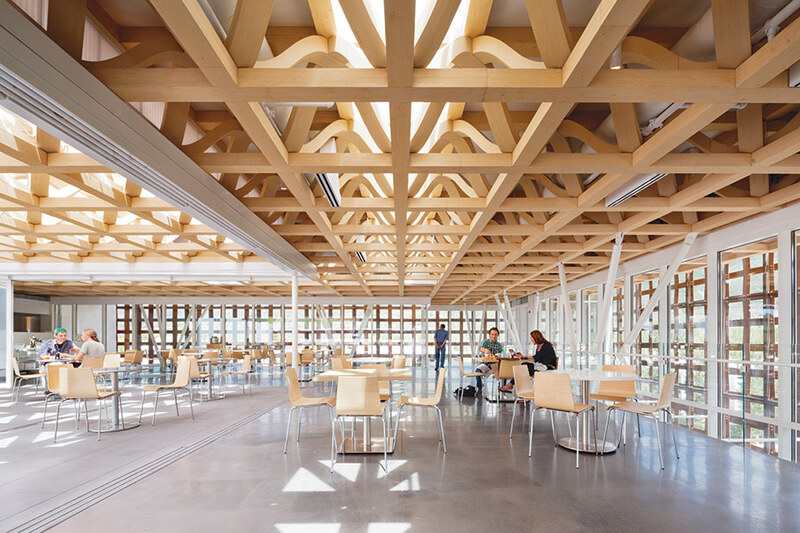 The timber space frame roof structure was fabricated by Spearhead Timberworks in British Columbia. 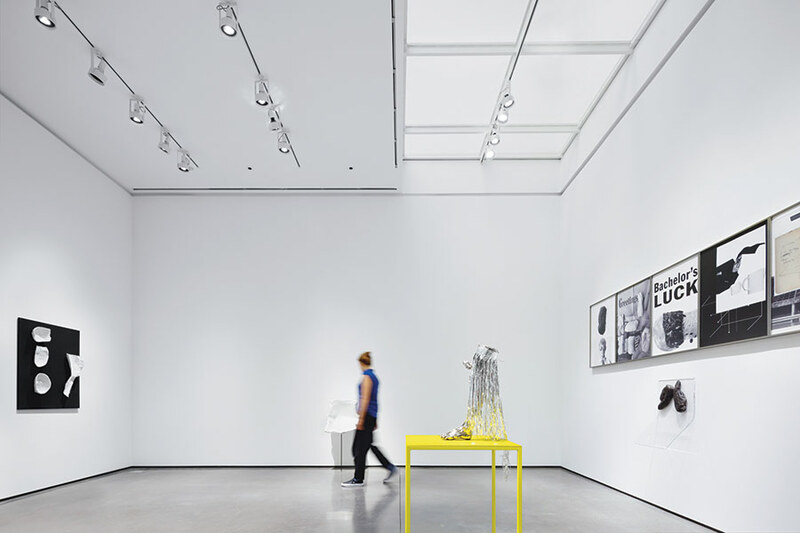 Ban optimized the available volume, squeezing in 33,000 square feet, 17,500 of which is exhibition space, by stacking three floors of galleries against the party wall (one below grade, two above); wrapping them in circulation, offices, and support spaces; and enclosing it all in a white metal and glass curtain wall. The top floor is half occupied by an outdoor sculpture garden, half by a café and event space. Structurally, the building comprises a composite system of three materials, each one doing what it does best. The first two floors are framed in post-tensioned cast-in-pace concrete. 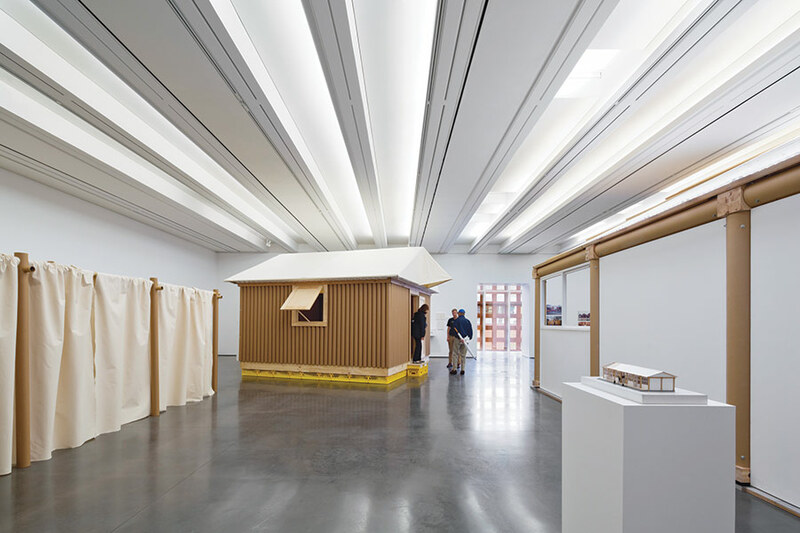 This system offered the most efficient floor-to-floor dimensions (about 16 feet), allowing the architects to provide 14-foot-high ceilings (to the bottom of the beam) in the gallery spaces while fitting the building within the zoning height limit. Spindly, exposed structural steel pipe columns in tree-like clusters of three keep the third floor space open and airy and support the third structural system, an exposed timber space frame that makes up the roof. The timber space frame is, in my mind, the highlight of the architecture, and you can tell that Ban took the most pleasure in working out this problem. It is composed of three types of wood: spruce chords, birch web members, and Douglas fir end caps. The webs have curving profiles that create flat interfaces with the top and bottom chords of the truss. This allowed the connection between web and chord to be made with a single steel screw—as opposed to a gusset plate connection—driven in from above so that it is invisible from below, giving the impression that it is an all-wood structure. Ventilation ducts, sprinklers, and lighting integrate well within the space frame structure. 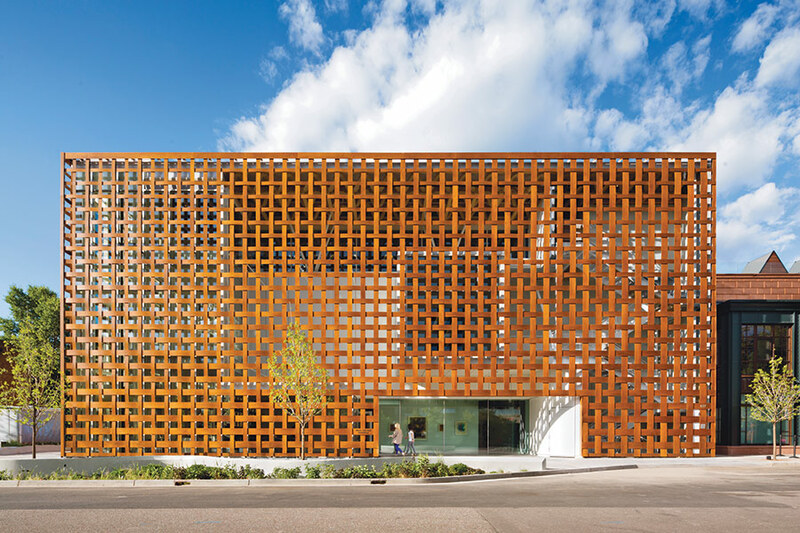 The street faces of the building (it is a corner lot) are wrapped with a woven Prodema screen whose wood veneer offers a warm, handcrafted expression that successfully cozies up to Aspen’s masonry and timber context. Underneath, however, you can detect an architectural problem, brooding. The screen is not uniform. Its apertures are larger toward the corner and top of the building. This variable geometry creates a bit of a discordant relationship between the screen and the building it conceals, a condition that is most apparent at night, when light emanating from the interior puts in profile the chaotic layers of rectangles and squares. 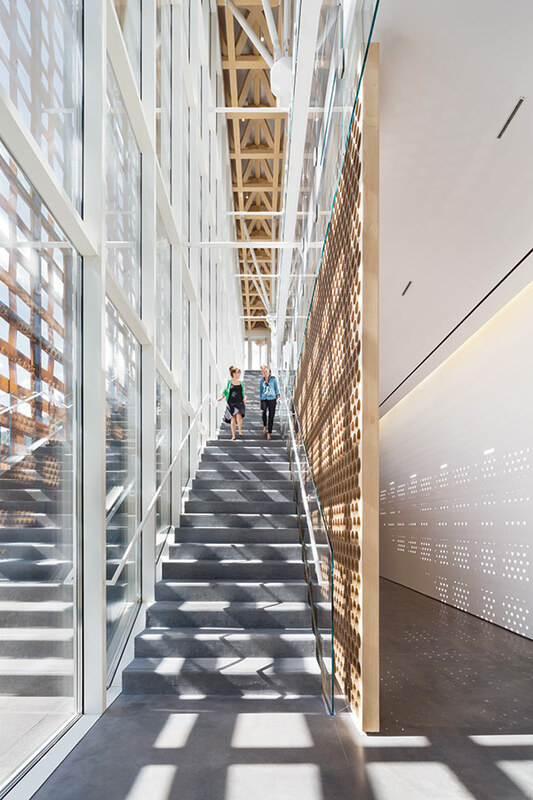 This shifting geometry provides the best views, out and in, at the corner, where a glass elevator allows visitors to gawk at the surroundings as they ascend or descend, while creating movement in the building when viewed from the street. 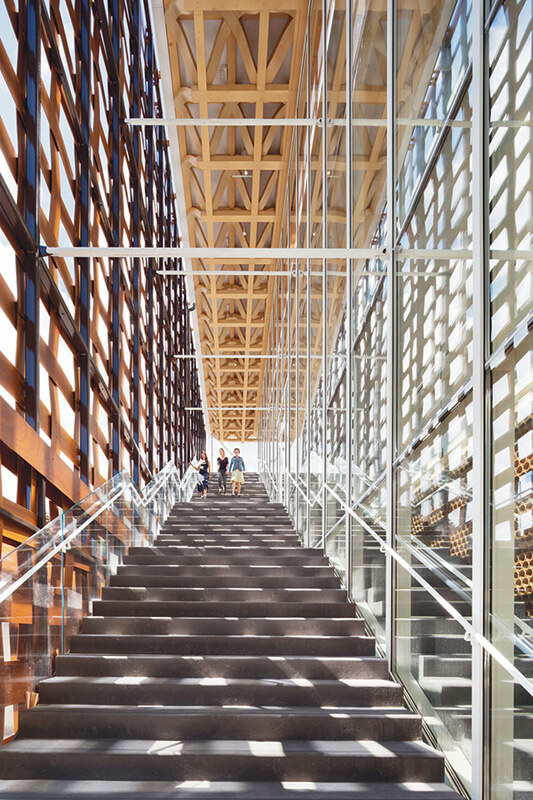 A grand stair between the screen and glass curtain wall also shows some movement to the street. It provides access directly to the top of the building. There, the sculpture garden and café can be open to one another or closed off, depending on the weather, by way of a manually operated sliding glass wall. Either way, this space provides rooftop views, which are a rarity in Aspen. Ban, however, directs the view north to the ski slopes, as opposed to east toward Independence Pass and the Continental Divide, which, as locals will attest, is the most impressive sight in Pitkin County. A second stair just inside the curtain wall, which mirrors the one outside, provides access to the gallery spaces. The idea behind this circulation scheme is that, as on Aspen’s ski slopes, visitors can climb to the top before “sliding” down through the exhibition spaces. But this architectural conceit may be lost on many visitors, in spite of the meaningful view of the slopes, because it is just as easy to enter at the bottom and go up. Ban reportedly at first wanted to tightly control the circulation sequence, allowing only one way to proceed through the museum, but Zuckerman Jacobson put her foot down, explaining that in the U.S.A., especially in the West, people expect a little more freedom of movement. Another place the collaboration, or perhaps conflict, between Ban and Zuckerman Jacobson shows is in the use of natural light in the galleries. Four out of the six galleries feature some access to daylight, while two are completely artificially lit. Zuckerman Jacobson originally wanted all black box spaces where she could have total control over the lighting, in keeping with at least the past 50 years of curatorial thinking and gallery design in this country. Ban, however, convinced her after a tour of naturally lit gallery spaces that she could have some control while taking advantage of the dynamic qualities of natural light. Art, after all, is created in natural light, Ban’s argument ran. But, as with the muddled circulation concept, the blending of daylight and artificial light here is something of a failure. For one, there is no regular or very successful solution for bringing sunlight in (sometimes it enters from the side, sometimes from strangely aligned skylights). Secondly, what natural light does make it in is more than overpowered by the electrical lighting. Thus the daylighting seems something of an afterthought and—like much of AAM, regrettably—achieves nothing of the gripping synthesis of which there are now many examples in the museum world.